The latest bout of market volatility has taken some helium out of the stock market’s balloon nearly a decade into a bull market run that’s seen the S&P 500 more than quadruple from its March 9, 2009 bottom. The market moves have also caused many portfolios to drift quite a bit from their allocation to stocks and bonds as the former has outraced the latter. Though the recent near-correction (a decline of 10% or more from a prior high) in the markets may have tempered stocks’ outsized performance some, you can still expect to see the usual year-end media attention on the questions of when, why and how you should rebalance your portfolio. Despite all of the air time and column inches devoted to the subject and nudges from the big fund companies, the conclusions are often the same—sell your winners and buy your losers, at least annually, if not every quarter. But dig into the data and you’ll find ample reason to question if rebalancing that often—or even at all—is necessary, even during times of heightened market volatility. Rebalancing advocates tout its risk control strengths—that maintaining a target allocation between stocks, bonds and other asset classes can effectively manage the overall risk in your portfolio across market cycles. For example, say you start out with a basic 50%–50% mix of stock and bond funds in a portfolio. After a period when stocks outperform, it may become skewed to a 60%–40% or 70%–30% mix, leaving you at increased risk of shedding those gains if stocks drop. That’s the essence of rebalancing theory: Keep allocations in check, thus reducing risk. On the face of it, that’s good (if superficial) advice. We’ve seen Fidelity and Vanguard address rebalancing over the years, typically recommending folks rebalance either on a semiannual or annual basis, or when allocations drift more than 5% or 10% from their targets. Seems a bit simplistic to us. So let’s run some numbers to check it out. We built a hypothetical portfolio of index funds with a 50%–50% split between stocks (Vanguard 500 Index) and bonds (Vanguard Total Bond Market Index) and tracked the results of several rebalancing scenarios from January 1987 (just after Total Bond Market Index’s inception) through September 2018. Our findings were pretty conclusive. We looked at rolling returns for each scenario, analyzing average returns as well as the best and worst returns for one-month, one-year, three-year and five-year periods—the less frequently you rebalance, the greater the return potential and greater the volatility over any given period. When we’ve run this analysis in the past over shorter periods, some of the rebalancing strategies posted slightly better returns, but after a strong year for stocks in 2017 (and for most of the post-credit-crisis bull market run), the no-rebalancing strategy posted the best overall gains. It’s worth noting that no matter which period we looked at, the average annual returns are all very similar, with just 0.61% separating the best performer (no rebalancing) from the “worst.” But you can see much wider swings when comparing the best and worst periods. For example, the 65% swing from best to worst 12-month periods for the portfolio that was never rebalanced compared to a 51% or 52% swing for the three regularly rebalanced portfolios. So rebalancing does appear to have a positive effect on a portfolio’s volatility—you won’t hit the same heights, but you are also unlikely to feel the same losses than an untended portfolio can suffer. A frequently rebalanced portfolio also stays much closer to its target allocation, but can still be impacted by periods of high market volatility. Through September 2018, the portfolio that was never rebalanced ended up with a roughly 79%–21% split between stocks and bonds (though that is likely to come down after October’s poor stock showing). The most frequently rebalanced portfolio—most recently in July 2018—ended up close to its original allocation with a 53%–47% stock/bond mix. Note: Chart shows hypothetical growth of $100 invested in a 50% Vanguard 500 Index and 50% Vanguard Total Bond Market Index portfolio that was rebalanced with the frequency specified from 12/31/87 through 9/30/18. This chart tracks the growth of $100 in our hypothetical portfolio split between stocks and bonds using various rebalancing schemes. Over the long haul, returns don’t really suffer that much for the more frequently rebalanced portfolios even though they showed lower average returns over shorter periods. By September 2018, the never-rebalanced portfolio held assets worth $1,472.23, while the semiannually rebalanced portfolio’s value was $1,294.94, a difference of $177.29, or about 14% over 30-plus years. At this point in time, the results make a stronger argument for the never rebalancing approach, but it’s important to note that this is just a single point in time after a very strong period for stocks. The last time we did this analysis, in early 2016, the long-term returns were nearly identical across the board—so back then, it would have been fair to say that rebalancing worked as intended. Taken in that perspective, what we’ve seen over time doesn’t make a powerfully convincing argument for never rebalancing nor for the inconvenience and transactional costs of doing it often, either. So what if you followed Fidelity and Vanguard’s recommendation, and rather than use a set time period to decide your rebalancing strategy, you used portfolio drift—rebalancing when the spread between stocks and bonds exceeded 5% or 10% as a result of market activity? Note: Table shows hypothetical returns of a 50% Vanguard 500 Index and 50% Vanguard Total Bond Market Index portfolio that was rebalanced with the frequency specified from 12/31/87 through 9/30/18. Looking just at the number of trades and the average months separating them, it seems like a pretty doable strategy—with a 5% spread threshold, you would’ve traded about once every 8 months. Up it to 10%, and you’d trade once every year and half or so. But that’s misleading. The frequency of trades varied significantly over the nearly 32-year period, with a few periods requiring a flurry of trades after longer gaps with no trades. For example, with a 5% threshold, from January 2008 to January 2010 you would have made seven trades as stock market declines regularly pushed the balance of the portfolio towards bonds. That means seven times you would’ve had to face the daunting psychological task of putting more money into stocks as their value was falling. 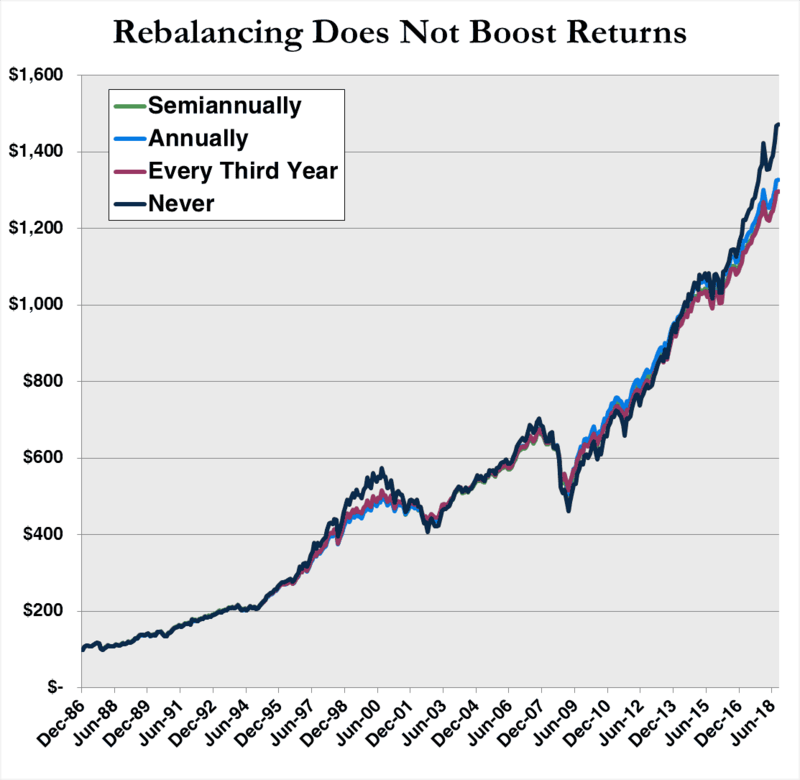 This week, we looked strictly at returns and found neither a convincing argument for nor against frequent rebalancing, but there’s more to the issue than just performance. 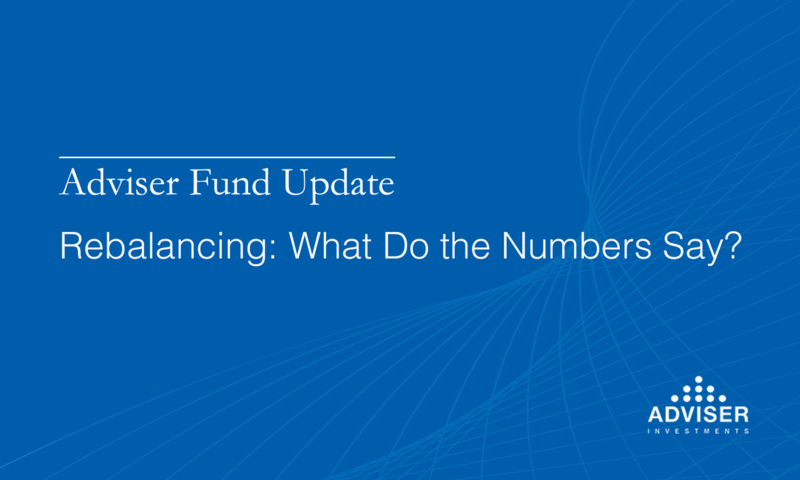 In an upcoming Adviser Fund Update, we’ll have more on the subject, including key concerns that anyone developing a rebalancing strategy needs to consider. Stay tuned! Last week, in our live quarterly stock and bond market update, Peak Earnings Doesn’t Mean No Earnings, we shared our firm’s views on the markets and expectations for the months ahead. Vice President Liz Kesselman moderated a wide-ranging and informative discussion with members of our investment and research teams, led by Chairman Dan Wiener and Director of Research Jeff DeMaso. If you missed the event or would just like the chance to watch it again, you can view Peak Earnings Doesn’t Mean No Earnings here. Disclaimer: This material is distributed for informational purposes only. The investment ideas and expressions of opinion may contain certain forward-looking statements and should not be viewed as recommendations, personal investment advice or considered an offer to buy or sell specific securities. Data and statistics contained in this report are obtained from what we believe to be reliable sources; however, their accuracy, completeness or reliability cannot be guaranteed. © 2018 Adviser Investments, LLC. All Rights Reserved.